This week's competition asks for images showing anything and everything connected to canals. 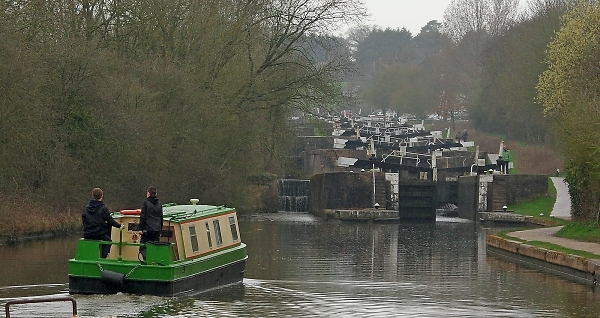 This can be the infrastructure, such as locks, gates, towpaths, and so on; or perhaps the boats that ply the network, along with the people who use them. Canals exist all over the world, so all our members should be able to find something wherever they live. Pentax cameras only please, but the age of the images doesn't matter - something from your archives or new images are both included. We first found our love of canals by discovering oddments of derelict remains, this then taking the form of a sort of quest to find out more about what they were. So, from walking miles of derelict waterways, climbing the derelict (at the time) Caen Hill locks at Devizes, to exploring the underground Salford Junction Canal, several years of discovery ensued. Hence this week's competition subject, and without further preamble let's get straight down to looking at the images. Green by Daronyl – A wonderful backwater, with great colour and reflections. Water brings images to life and I can really appreciate the quiet contemplation of this shot. Our Canals Live on by GlynM – Excellent idea, with lots of information included in the image. A compositional purist might prefer slightly more space in front of the van, rather than behind it, but it's a small point. Nonetheless, with many great images competing, the small points can be the ones that make the difference between winning and not. Watercraft in Harbour by perspicador – A sharp and well exposed shot, but is this a canal image? A harbour is not a canal, although it can be if it's the site of a sea lock. In any event, some stronger connection to the theme of canals would be helpful. Frosty Start by KimC – There are some brilliant pictures to be made of all the glorious colour of canal narrowboats. This one is a tad light for me, which also has the effect of making the background a bit washed out. If it were to be all darkened down then the colour saturation would be much more dramatic. A Quiet Moment in Venice by smudge – A wonderful corner of Venice, with lots of interesting architectural details. People in the boat would add interest, but the main point for me would be that, as with the previous image, it's a little too bright. Darkened down it would have more impact. Crossing the Pontcycyllte Aqueduct by newbiek50user – When we crossed this aqueduct, the water all contained in an iron trough laid across the top, my cousin actually had to hide inside the boat. She was terrified of the height. No fears for the inhabitants of this boat though, who are both clearly having a fantastic time. A great, clear and clean shot with great human interest. May I suggest a crop along the top to remove the triangle of sky? Kennet and Avon Canal in the Evening by EricD1306 – This is a lovely scene, showing exactly the sense of peace as the light fades. It's possible that we don't need quite so much sky and a more letter-box format could increase impact. Trouble on the Wharf? by JAK – photojournalism strikes, with human activity backed up with some great canalboat colours and designs. The low light and shadows help things along very nicely. Pontcycyllte Aqueduct by noelm – This telephoto shots shows off the construction of the aqueduct very well, with its tall, elegant brick piers and that fragile looking iron trough laid across the top. It is amazing that it has stood the test of time for so long, and still remains in regular use. A classy shot. Victoria Quays by paulb531 – This suits black and white and would probably also suit sepia. It tends to be a timeless sort of shot. Full use has been made of the picture space, including the fine reflection of the foreground narrowboat. And the rain poured down by davidwozhere – A well arranged shot, with that fantastic staircase of locks in the background. This will be hard work and it could take some time to work up through the locks, but it's all part of the fun and experience of boating on the canals. Lock Gate Resident by davidstorm - I do like the lateral thinking, and rather than an architectural shot David offers us an excellent bird picture. The canal backdrop can be easily recognised, thus fulfilling the brief of the competition very well. A fork in the canal by stub – A vast, wide angle interpretation from Stuart, and very good it is too. I like the openness of the shot and the way that the ripples in the water have been allowed to fill the foreground. Wigan Pier by drofmit – Wigan Pier as a subject can be quite mundane, but this interpretation is anything but. I really like the faded sepia tones which give a period feel to the image. In fact, I can't spot anything that could indicate the actual date of this, which could quite easily be anything from the 1940s onwards. Under The Arch by Nigelk – A well thought out image, but perhaps one that could do with more interesting subject matter. As a record of this small corner of the canal network perfectly satisfactory though. Canal Boat by Aitch53 – An interesting narrowboat that could, in my opinion, be somewhat darker to get the best from it. Grand Union by Simonmac – This is very effective. It's hard to go wrong with a scene like this, which has such interest there. But of course the excellent technique clinches it. A perfect choice for black and white. Small Canal by noelcmn – Very interesting! I do think though that the resolution is a bit on the low side. With such a lot of information in the shot, a larger file size would render the detail better. Seven swans-a-swimming by MikeInDevin – Another great idea and an almost perfect line-up of swans! WINNER is And the rain poured down by davidwozhere, a great, atmospheric shot that sums up so much about canal holidays. THIRD is Grand Union by Simonmac, another classy, effective shot that cried out to be black and white. HIGHLY COMMENDED images are by Daronl, noelm, paulb531 and davidstorm, well done all! Many thanks for the great turnout of entries, always good to see, and I hope you find the critique helpful and constructive. By its very nature, and competition has to find a way to differentiate between images, and sometimes the differences can be very small. All the images are of a high standard, so congratulations to all those who entered. Thanks for the rapid judging and interesting competition. and congratulations too, to the other podia positions and HCs. Had to trawl a bit, tho.... been away from any canals for some time... so long in fact that all the better shots were proceeded by DSFC... so the non-Pentax years!! Yes, John, Wigan Pier can be mundane... all the best bits were indoors, away from the canal!! And I was after a timeless look, thank you! Had to crop out a huge Mitsubishi people mover, tho'! Dead giveaway!! Much higher number of entries this week, great to see. Some cracking images. Well done the podium places and HC's, cracking winning shot! My first competition. Tip my cap to winner's and highly commendeds.. Well done to you, and those of us that will have to try a little harder.. Thanks for the inciteful comments John and taking the time to judge. Congrats David, Excellent shot, worth a long study. Love the colors in that one! And extended to NewbieK50user and Somonmac and not forgetting the HC's Daronl, noelm, Paulb531 and Davidstorm. Gratifying to see so many entries this week, so kudos to our judge for the challenge and the CC's. Not forgetting that the entries were as usual of a high quality and visually ever so pleasing. Congratulations David on winning the competition with a great shot, which really conveyed the ambience and heritage of our wonderful canal system. I also would like to pass on similar congratulations to the two runners up whose entries were also top drawer. Also John Riley really should be commended on bringing such an interesting subject to this competition which pleased me particularly as I seem to have spend most of my photographic time on the towpath throughout the summer. Thank you for the place. What a great competition. Super entries across the board. Well done to the winner and those places and commended. And thank you John for the great observations. This was my first competition. Thank you for the constructive comments and congratulations to David the winner. Thank you, John, for the 1st place and congratulations to Newbiek50user and Simon. I wouldn't have been surprised at a number of these excellent submissions winning. It would be great to have more "new" names in the competitions, so I have pitched this week's contest right where everyone can have a go at it. I shall be away on Sunday so I will only be able to pick a winner. The write-ups will follow.